SEO Audit Checklist: What Should You Look For? Wondering why your site traffic seems sluggish? You may be due for an SEO audit. SEO audits: they’re hardly the most exciting subject for many site owners, which is why so many skip them entirely. But running them is an important part of maintaining a healthy and efficient site—a little getting your oil changed, or going to the doctor for an annual physical. Identify weak points in your SEO strategy. Review and update your keyword lists. Reduce load speed for better site performance. Remove any negative SEO factors that might be holding you back. Maintain and update local SEO directories. Of course, an SEO audit can achieve much more than this. To understand how, let’s take a deeper dive. Determine what kind of SEO audit you want to run. SEO audits can run down many rabbit holes, but it may not be necessary to run down all of them at once. For instance, you may have a good grasp of your website content, but you may not know how well your site is optimized for local search. Or you may feel that some aspects of your technical SEO are not executed as well as you would like, or that your user experience is falling behind. You will need to cover every aspect of your site’s SEO at some point, but since it may be difficult to keep track of everything at once, we’ll break it down and cover each main component separately. Building a strong linking strategy is a key part of SEO, but it takes some management. Broken links and poor anchor text are some of the most significant concerns. A link audit should include checking for any broken links, and either removing them, or re-linking them to updated content. As for anchor text, it should describe where the link will take a reader. (You should never use “click here” as your anchor text.) If your audit yields non-descriptive anchor text, go back to those pages and edit the copy to be more informative. These are links from one page on your website to another page on your website. They move your visitors through your site and help funnel them toward valuable or high-converting pages. Examining your internal links can indicate cornerstone pages that receive a lot of internal link traffic, and it can also bring up pages that are not linked to from your site. These are links from your website to an outside domain. You mostly use these to link to external references or resources. External links are usually a positive ranking factor, so long as they’re done naturally. However, because they lead away from your site, you want to check that external links always open in a new window. Also, because the sites you link to are probably keeping an eye on their backlinks, external links can be a tap on the shoulder to other sites on the Internet. Backlinks are links from an external domain to your website. They’re a significant SEO ranking factor, if they’re well-earned. However, there’s also such a thing as a malicious backlink, such as those coming from domains with low credibility. If Google sees a lot of low-quality backlinks, it may think you’re trying to purchase them, and will bump you down in your results. Hopefully, you’ve already researched various keywords for your site, and have incorporated them into your content strategy (more on that in a minute). However, keywords are always changing. New terms and phrases rise up, others fall out of use, and as your domain strength grows, your ability to rank for certain terms will shift as well. What keywords do you currently rank for? Who are your biggest keyword competitors? What keywords should you rank for? What about long-tail search results? How have you incorporated keywords into your site content? Do any of your pages compete for the same keyword? For your biggest keywords, you will want to create pages specifically optimized to rank for those terms, even if you use those words and terms elsewhere as well. As you identify more keywords, you will want to create pages optimized for them as well. And of course, you will want to avoid optimizing pages for irrelevant keywords that don’t have anything to do with your site. A thorough content strategy is one of the best ways to build your website’s SEO. However, content strategies can shift over time as your business strategies shift. Your SEO audit should remove any outdated content, but it should also check for potentially negative ranking factors. Thin content. If you have a lot of pages with only about 100 words or less, it is an indication for poor, low-quality content. Even product pages should have product descriptions and customer reviews. Duplicate content. Content that repeats across multiple pages lowers the ranking power of each page, because Google doesn’t know which to prioritize. If you have two pages with the same content, canonicalize one so Google knows which is the priority. Keyword stuffing. There are many ways you can end up with low quality content on your site, but keyword stuffing is one of the most egregious. If you have pages on your site that have keywords crammed in at the expense of grammar and readability, you aren’t doing yourself or your users any favors. Write high-quality, long-form content. We’re talking 1000 words or more. Write often, and post it to your blog. That’s what it’s for. Meta descriptions. These are what appear as the short text on Google search results. If you don’t write them yourself, Google will pull an excerpt for you, and it may not be what you want. Header tags. These are the H1, H2, H3 HTML tags used to stylize your page and create visual hierarchy. Your users will scan these tags as they scroll down your page to see what your article is about. Google will also check these for keywords, so use them when natural. Page title and URL. Your page title should include the keyword or phrase you want to rank for, as should your URL. They should match, although you can remove stop words from your URL if it is too long. Load speed. If your site is slow, your visitors will leave. Check the load times on your pages, and pay close attention to ones that are underperforming. Navigation. Your navigation should be easily visible and accessible. If possible, implement breadcrumb navigation to help guide your users. Exit pages. Users can have many valid reasons for leaving your site on a specific page, so the fact that a page has a high exit rate isn’t necessarily a red flag. However, if you find users are leaving pages in high numbers when you would have expected them to stay or move on, check it for usability errors. The two main components here are image size and alt attributes. Large image sizes not only have a negative impact on the load time of your website, they’re also completely unnecessary. You may have an amazingly high-definition browser, but the human eye can only detect so much, screens are only so large, and your users usually don’t need to zoom in on most of your images. For the most part, that means file sizes of 80–100kb. If you have a lot of images measured in MBs, then compressing them could significantly improve your site speed. As part of your SEO audit checklist, you will want to identify and update any images without alt attributes. A good alt description reads like a short sentence, and uses clear, natural language to describe the content of the image. Using keywords in an alt description is only good if it fits the image and can be included naturally. Encryption. You should have SSL encryption on your website, to protect yourself and your users. This is still a minor ranking factor, but it’s one Google is becoming increasingly strict about. Redirects. There are many valid reasons you would have a redirect on your site, such as directing from https://www.sample.com to http://sample.com, or from a frequently misspelled version of your domain to the correct version. However, there are ways you can accidentally stack redirects on top of each other in ways that slow down your site. Look for these situations and reduce them if possible. Caching. This helps browsers store some information on a browser so that it doesn’t have to be retrieved from your site every time. Creating a caching policy can help browsers render your site more efficiently. Indexing. Can browsers crawl your site? You may have some parts of your site that you don’t want to be indexed, but improperly-implemented robots.txt or no follow links can backfire and affect pages you otherwise want Google to discover. Mobile optimization. Do you have a responsive design, and does it load quickly? Since many users conduct local searches when they’re out ready to shop, having a mobile-optimized design is especially important. Business information. This includes your business name, phone number, address, and opening hours. If you have multiple locations, create separate pages for each. Make sure the information is up to date. Directories. Many organizations and websites have local directories for businesses. These can include your local chamber of commerce, yellow pages, and Yelp. Check these pages to make sure the information there is accurate. 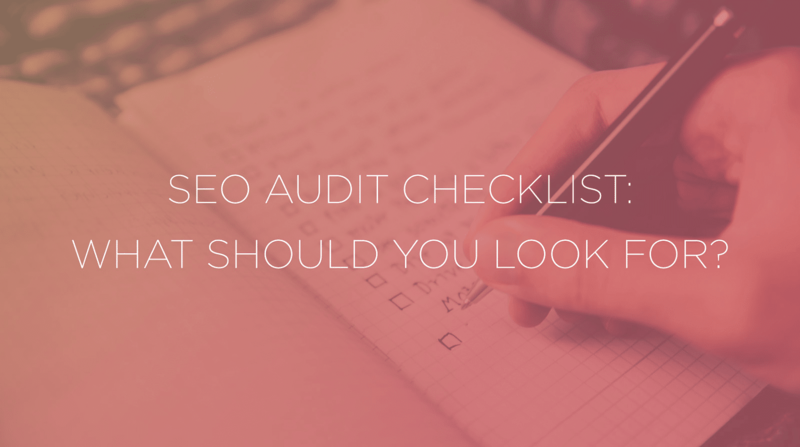 Use your SEO audit checklist regularly to keep your website running smoothly. As we said, SEO audits aren’t a once-and-done deal. SEO itself is a growing and changing field, and the Internet is a dynamic environment with many moving parts. Over time, links on your website will break, you will need to disavow bad backlinks, and new SEO best practices will emerge. Keeping up with regular maintenance takes time, but it’s a critical part of any website—especially for businesses with a high content volume. The more you put it off, the more work it will be to clean house.